With a granite and glass façade, this trophy property is located in a unique urban setting with unrestricted views of the French Quarter and the English Turn bend of the Mississippi River. Built in 1984 on the site of the historic St. Charles Hotel, the building's unique design incorporates French Quarter-style balconies in keeping with the scale set by neighboring buildings. 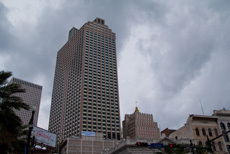 Located in the heart of downtown New Orleans' financial district, within one-half block of branches of the three largest banking institutions in Louisiana, and only one block from the world-renowned French Quarter, the 52 floors of Place St. Charles offer 1,004,000 total square feet of class A space. Floors 1 through 2 house Retail; floors 3 through 13 accommodate Parking; and floors 14 through 52 consist of Office Space. Our unparalleled amenity package includes: 58,000 square feet of retail space; two (2) restaurants; a 10-station Food Court; convenient banking; and connected to the Hampton Inn. Lastly, many major hotels and world famous restaurants are within a short walking distance. Place St. Charles's prestigious tenant base is anchored by Capital One, Jones Walker, Baker Donelson Bearman Caldwell & Berkowitz, Gordon, Arata, JP Morgan Chase, Fidelity Homestead Savings Bank, King Krebs & Jurgen, Energy Partners, HQ Global Workplace and GE Capital Corporation.